The thyroid is highly sensitive to the slightest alterations in your health and has an influence on hormonal function throughout the body, including the metabolism and repair of every cell. The thyroid is probably the most ignored and poorly treated gland in the body. Yet it is one of the most important areas to look at to improve energy and overall health. Situated in the neck just below the Adam’s apple, it produces hormones that affect every major organ in your body including the metabolism and repair of every single cell. 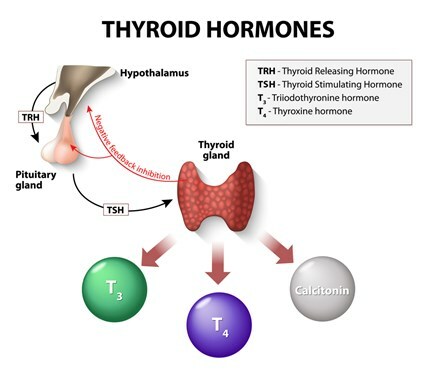 The most important thyroid hormone is thyroxine (also known as T4), which outside the thyroid is converted to the active form known as T3. The more T3 you produce the faster your metabolism. If you don’t produce sufficient thyroid hormones many systems in your body begin to slow down – heartbeat, circulation, blood pressure, energy levels, metabolism, detoxification and temperature. Slow metabolism will mean that you don’t burn calories as efficiently as you could so you gain weight more easily. 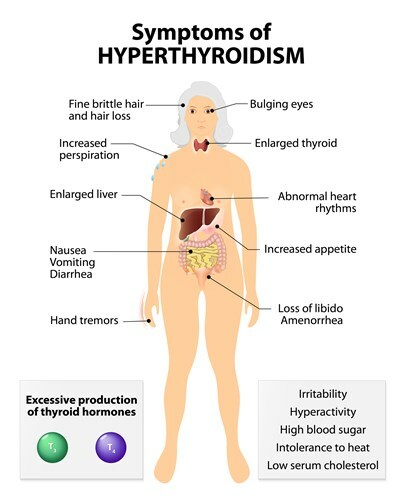 Hyperthyroidism – Most commonly caused by Graves Disease and is an overproduction of thyroid hormones. Hypothyroidism – By contrast, stems from an underproduction of thyroid hormones. Hashimoto’s Thyroiditis – A common cause of hypothyroidism. In this autoimmune disorder, the body attacks thyroid tissue. The tissue eventually dies and stops producing hormones. An under active thyroid is seven times more common in women than it is in men. Low thyroid function is almost always secondary to some other condition, such as adrenal stress. With over 80% of under active thyroid cases, the patient most likely has a form of autoimmune thyroiditis called Hashimoto’s. As with any autoimmune condition it is better described as being a case of mistaken identity in the body, where the body is attacking – in this case – the thyroid gland in preference to something else. 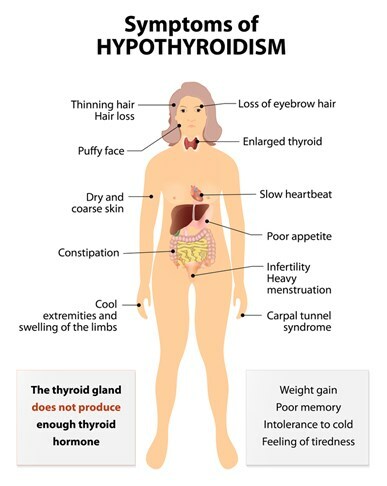 One of the main problems with thyroid health is that the standard GP tests are not very reliable in giving the full picture; and due to the attributing symptoms of depressions and the menopause, often women go undiagnosed and are offered orthodox treatments. At the London Clinic of Nutrition, we take a functional approach to assessing your thyroid health. A comprehensive panel including free T3, free T4, TSH, total T4, total T3, thyroid antibodies and T3 uptake is required, alongside adrenal hormone testing and iodine loading. We also use the Barnes Temperature Test to measure the auxiliary temperature of the underarms first thing in the morning five days in a row. At our clinic, our role is to assess and identify any thyroid imbalances, look at foods that may inhibit its function, deficiencies in minerals, amino acids, fatty acids and, often most importantly, we will look at iodine, stress and adrenal function. We will then correct these imbalances with lifestyle changes and various nutritional and herbal regimens. After 3 months of working together I am surprised and delighted In the way that I feel. The symptoms have gone and I have Oliver’s dedication to thank for this. I went from 3/10 energy levels to a consistent 8/10, over a 12 month time period. I now find that I can do things in the gym and at yoga that I have never been able to do before! I came to see The London clinic of Nutrition after seeing other thyroid testimonials and decided that these were the right people to help me. I had suffered with fatigue, dry skin, brittle nails, bloating and constipation for many years and all my blood work with the GP was ‘normal’ on multiple occasions. On meeting Oliver he advised that the blood work was far from normal and that even with a basic thyroid panel from the GP that the T4 and TSH levels were not right from a functional perspective but more importantly I had the symptoms. After a few private lab tests and 3 months of working together I am surprised and delighted In the way that I feel. The symptoms have gone and I have Oliver’s dedication to thank for this.